About a year ago a 9 year old boy came to my office after a traumatic accident. He was hit in the mouth with a baseball and his teeth became loose. His mom had noticed some discoloration of teeth #8 and 9, but he had no pain or sensitivity as a result of the dental trauma. So the discoloration was her main concern, and her son did have a history of Hemophilia A. The teeth had been subluxated. You can see some gingival hemorrhage in the sulcus and there was some mobility, but the teeth were not displaced. The teeth were obviously tender to percussion. Diagnostic tests were performed and teeth #8 and 9 had a normal response to cold. His diagnosis was Normal Pulp and Symptomatic Apical Periodontitis #8 and 9. I apologize for my pre-operative radiograph and photograph, but the patient was too uncomfortable and it was difficult for him to take the x-rays. He was clearly a bit banged up from the accident. Since the teeth still had slightly open apices, my goal was to try and keep the teeth vital as long as we could. My treatment plan was to monitor him and continue follow-ups. The mom was instructed to watch for discoloration and any sensitivities during the follow-up period. One year later, the patient came back and was still asymptomatic. The teeth also didn’t appear to change in color. The teeth still felt cold (although not very strong) and still had no pain to percussion. There is no sign of endodontic pathology, but there were other changes that I saw in the radiograph — the lumens of the canal space were starting to calcify. or a tooth can undergo pulpal metamorphosis / pulp canal obliteration. This case is a perfect example of what I mean by pulp canal obliteration. You can see that the lumens of #7 and 10 have not really changed, so something metamorphic is definitely going on. 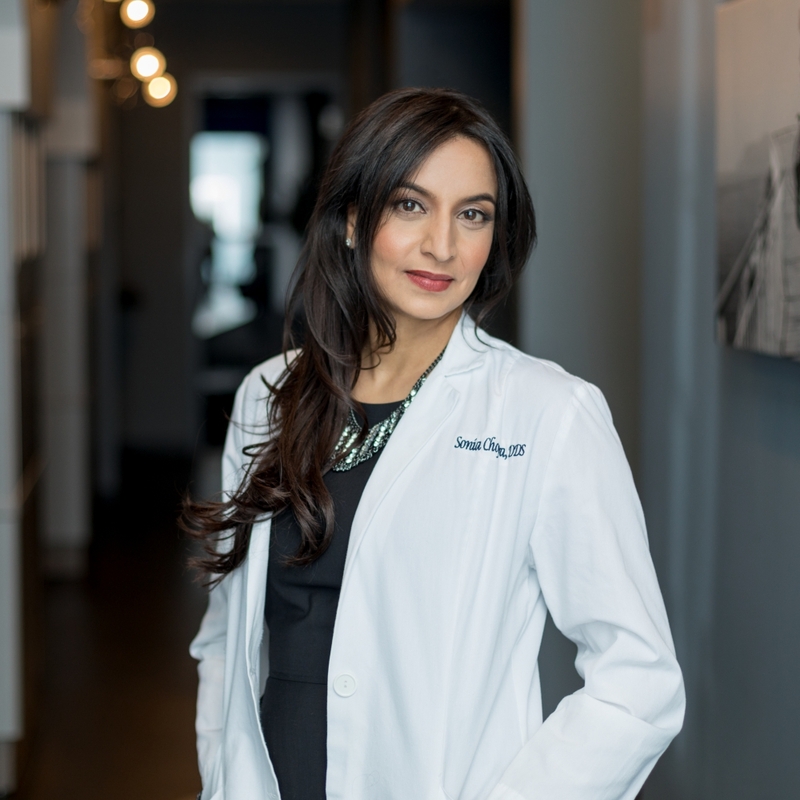 Now the question — what do you do for treatment? Do you keep watching the teeth and do no treatment? 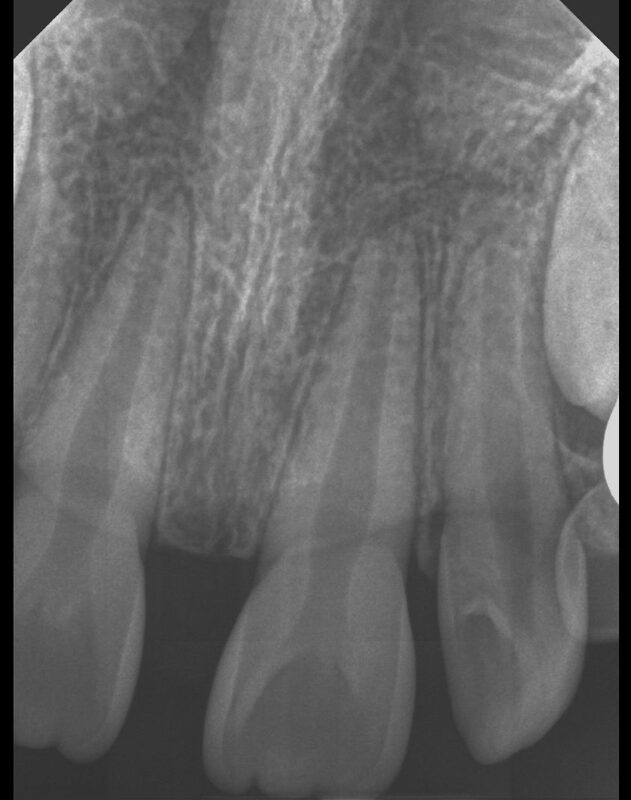 Or do you intervene now before the canals completely calcify? Monitoring the teeth appears to be the more conservative treatment unless you look at this case in another way. If the canals completely calcify, then the risk of procedural errors like root perforation go up tremendously. The risk for apical surgery also goes up, and this, in my opinion, is not that conservative, especially for a little boy. The good news is that root canal therapy is pretty conservative now as opposed to one year ago. The dentin thickness is greater on the sides of the canal, and thus, the tooth is stronger. 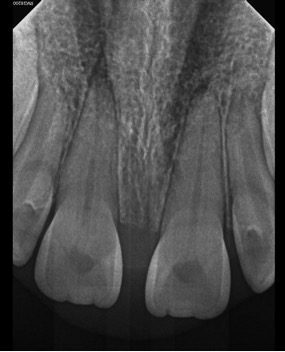 The research shows that cases like these go necrotic and require endodontic therapy only about 15% of the time. I know that the chances are low, but when treatment is simple and straightforward like it is at this time, I prefer to do treatment now. But, it’s not my child and it’s not my body. I understand the dilemma his mom may have about proceeding with treatment right now. So what did I do? I presented the mother the treatment options and told her that she should really think about it. I could tell it was a lot for her digest, and I wanted her to take her time, so I reassured her that she did have some time to make a treatment decision. My question is, what would you do if this was your child? I would love to hear your suggestions below. I think I would wait on the RCT if the teeth still tested vital. I think it’s a hard call though. Totally agree, Meena. That’s why I posted this, so we all have a voice in that discussion! This is a very good case and a really understandable presentation. My suggestion for this treatment would be to do a root canal treatment due to the following reasons. 2. There is a drastic difference in one year as the canal space narrowed very soon, chances of becoming an obliterated or closed canal is very common after which we will have to risk ourselves in finding the root canal and chances of procedural errors and perforations will become common. The parent should be informed of these conditions and explain all possible future complications if treatment is not initiated. This is to my knowledge. Thank you. That is some significant PCO! And, at this point, root apices are closed. I agree with you 100% and I would have done/recommended the same (even on my kids). However, I find that most patients without symptoms – especially? parents – are hesitant to proceed with treatment. I’d love to know how this story ends!!!!!!!!!! Thank you – I’ll post an update!